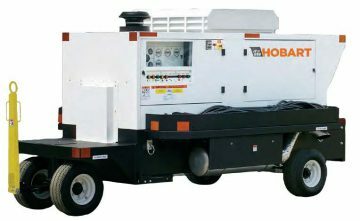 The Hobart 140CU20 (140kVA) and 180CU20 (180kVA) are mobile diesel-driven 400 Hz. Ground power units. They are powered by a Cummins Tier 3 diesel engine coupled to a Hobart generator. Hobart 400Hz Generators are the benchmark of quality and reliability giving users the best power quality without sacrificing durablity. The Hobart 140CU20 and 180CU20 features a simple easy to use control panel with illuminated analog gauges and back lit push buttons. Removable access panels allow the user easy access to the engine, generator and control compartments.The CU20 Series is available in 140kVA and 180kVA versions with an optional 28.5 VDC Module.